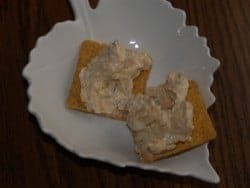 This makes a tasty dip that is perfect for crackers, cheese, and summer sausage. Don’t buy pre-packaged dips when you can make something this delicious at home. Bacon and Cheddar dip can be put together in no time at all. Combine ranch dressing mix, milk, and Miracle Whip, Cheddar cheese and cream cheese. Blend in bacon bits. Refrigerate for 2 hours before serving. This is best left overnight before serving. Made this a couple of days ago, still thinking about this dip!